Myself, mother, reader and writer: in that order! I spent a large part of my childhood immersed in stories - from books, grandmothers, comics and servants alike. In fact, I was a mean storyteller myself by the age of five. Brer Rabbit happily rubbed shoulders with Muyal Mohan and, later, Romeo and Juliet with Kanagi and Kovalan. ​However, it was when our maid said, “And then ... Murugan threw his vel at Surapadma,” or Amma said, “And then ... his father ordered an elephant to trample Bhakta Prahalada,” that I sat truly entranced, wide-eyed and gape-mouthed. And, later, it was these tales which served as spicy accompaniments to plates of idlis and milk rice as my two sons gasped, “ And then ...” after each mouthful. Decades later, at the ripe old age of fifty-two, when my boys urged, “Write, Amma!” I found myself turning back to those stories closest to my heart. And so, my very own ‘Shiva Trilogy, or should I say, ‘Puranam Trilogy’? 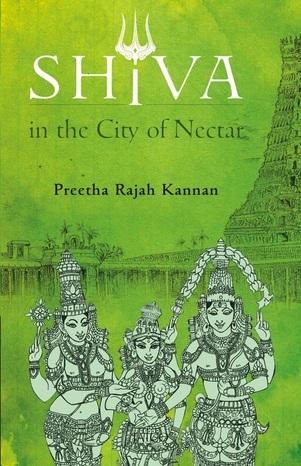 happened: Shiva in the City of Nectar - the Thiruvilaiyaadalpuranam; Son of Shiva -the Kandhapuranam and Hounds of Shiva - the Periyapuranam. We revere these three Puranams as representing Shiva’s three eyes. This is a very apt analogy as these epics, like the Lord’s eyes, are founts of consciousness and wisdom. Perennial wellsprings of devotion, tolerance, egalitarianism, forgiveness .... the list goes on and on! But, leaving aside philosophy, these tales are a joyous celebration of our faith and way of life. So, dive into my ‘Puranam Trilogy’ and rediscover your roots.